As I write this annual, end-of-year appeal, I am grateful and excited. I am grateful for the 12 consecutive years I have been involved as editor or creative director of the magazine – so many inspiring people and so many provocative topics. And I’m excited about the coming year as we hire, train, and support the transition to a new team to carry on the work of the magazine. This work is very meaningful for writers, artists, editors, volunteers, and most importantly, readers. It is reader response, support, and engagement that keeps this project going. 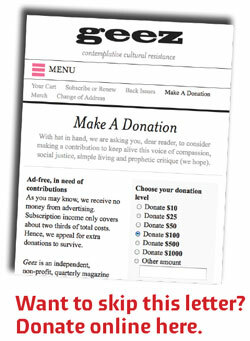 I’m a monthly, five-dollars-a-month donor, but I wanted to send a little extra this month, because the Summer 2017 issue on “Exodus from Empire” has profoundly affected me. Thank you for producing such rich, beautiful, and subversive content. It is so very refreshing in a spiritually dry season in my life. Many of us are also in a “spiritually dry season.” Hearing the struggles and stories of others who care about social justice, art, and activism is encouraging. This year again we received top honours from Canadian Church Press. 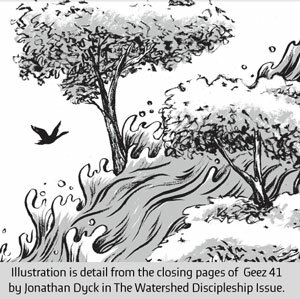 We won first place for best “Edition Layout and Design” for the Watershed Discipleship issue, (Spring 2016). As you likely know, we only ask for donations twice a year, once in the middle and now at the end. This magazine is truly reader-supported, with no income from advertising (on principle) or major government grants (although we’re working on that). Your contribution, large or small, makes a big difference here. So, please join this mission and consider making a year-end contribution to solidify your part in this supportive community of Geez readers. *If you wish to become a Geez monthly donor, please select the “monthly” option on our donate page or contact us at subscriptions[at]geezmagazine[dot]org.